Spray and flour a 10 inch round cake pan or 9x13 aluminum pan. In a large bowl, sift together the cornmeal, flour, baking powder, salt and baking soda. In a medium bowl, beat together the oil, honey, and sugar until pale in color. Then add egg yolks, one at a time, beating well after each addition. Add wet mixture to the dry mixture and stir just until combined (do not over-mix). Stir chestnuts, thyme, basil, and parsley into the batter. In a separate bowl, mix the vegetable broth and applesauce together. Gradually stir in the broth-apple mixture, 1/3 at a time to the batter. (If batter seems overly dry, add a little more vegetable broth, a tablespoon at a time. ); In another large bowl, beat egg whites to semi-stiff peaks with an electric mixer. Fold egg whites into batter. Pour batter into prepared pan. Bake until top is golden and slightly puffed, about 50 minutes. 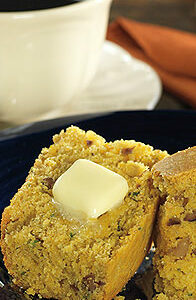 Cool corn bread in pan on rack 10 minutes.